Put the 65XE9005 fairly into the context of its surprisingly affordable price and it becomes a really exciting option for serious movie fans unable to stretch their budget beyond £2,500. This Sony mid-ranger offers good all-round picture quality for its money courtesy of a crowd-pleasing direct lighting system. Most of us weirdos who spend the majority of our waking lives testing TVs seem to agree that LCD screens that use lights placed directly behind them (rather than around their edges) are best suited to the new high dynamic range (HDR) picture technology that's currently taking the AV world by storm. 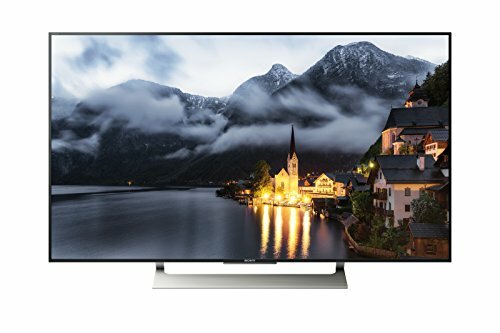 Sony appears to have noticed these weirdo musings, for tucked away in its 2017 range is the XE9005 series: a collection of HDR-capable TVs that don't just use lights placed directly behind the screen, but also deploy local dimming technology to enable different segments of those LEDs to deliver different levels of light, as required by the image you're watching. Even better, they deliver this "catnip for AV fans" lighting solution at much lower prices than most direct-lit LED TVs. The 65XE9005 under scrutiny here costs just £2,500 in its post-Brexit socks - a mere fraction of the price you're expected to pay this year for the likes of Samsung's 65-inch QLED TVs or LG's 65-inch OLEDs. But is Sony's new mid-range option really the answer to cash-strapped AV fan prayers it looks on paper like it might be? The 65XE9005 cuts an attractive figure. It's relatively svelte for a direct-lit TV, the ultra-narrow frame round the screen minimises the set's impact on your living room, and the centrally-mounted metallic desktop mount looks and feels pretty opulent. It's nice to find this stand delivering some really effective cable management, too, despite the decent bounty of connections on offer. Headline picture features beyond the direct backlight and local dimming stem predominantly from Sony's powerful X1 processor. This powers, for instance, Sony's Triluminos technology, to deliver a wider and subtler colour palette, as well as carrying a unique picture reference database used to help the 65XE9005 decide more accurately how best to upscale sub-4K sources to the TV's native 4K screen. It's important to note that the 65XE9005 does not carry Sony's most powerful X1 Extreme chipset. This means it doesn't carry the twin database upscaling engine found in step-up Sony models such as the previously tested 55XE9305 and 65ZD9 models, and can't be upgraded via firmware to handle the Dolby Vision HDR format. Its HDR support is thus restricted to the industry standard HDR10 platform plus, we're assured, the Hybrid Log Gamma (HLG) HDR system likely to be deployed by a number of broadcasters in the next year or two. If you like your TVs to provide access to huge quantities of apps, the 65XE9005's Android TV platform has got your back. If, however, you value ease of use and speed of access to the sort of services and features most TV viewers actually want to access, Android TV is much less successful. Fortunately the clunky interface does at least run more stably than earlier Android TV generations, and Sony has worked round some of the platform's limitations by incorporating the YouView platform for access to the BBC iPlayer, ITV Hub, All4 and My5 catch up TV services. You also get full HDR and 4K streaming support for both Amazon and Netflix. Coming to the 65XE9005 hot on the heels of Sony's step-up model, the 55XE9305, it has to be said that the XE9005 doesn't make a great first impression. It's nowhere near as bright as its more expensive sibling, meaning that HDR sources such as Ultra HD Blu-rays don't explode off the screen with nearly the same intensity. Backing this instant subjective impression up with some objective measurements reveals the 65XE9005's brightness topping out at around 875-nits on a 10 per cent white HDR window, while the 55XE9305 manages nearly 1500-nits. No wonder the difference in HDR intensity looks so immediately clear. Spending more time with the 65XE9005, though, sees that initial sense of disappointment fade away pretty quickly. So much so that by the time we were done it had actually turned into something of a mid-price TV hero. The main reason for this is the way its combination of a less aggressive light output and direct LED lighting engine help it produce a really lovely black level performance by LCD TV standards. There's far less general greyness over dark picture areas than we usually see with LCD TVs, even when watching HDR pictures that combine dark and bright areas in the same screen space. Even better, while there is some faint backlight blooming that can extend a good few centimetres beyond the edges of stand-out bright objects (the 65XE9005 only has around 20 individual dimming zones), this blooming is typically so faint you scarcely notice it. It only becomes at all distracting with really extreme (and thus rare) HDR shots where an ultra bright object stands proud against a near black backdrop. Certainly the 65XE9005's blooming distracts you less often than the more strident light clouding issues on the brighter 55XE9305 model. And there's no doubt that a certain type of movie fan, at least, will prefer this more generally immersive look to the XE9305 range's more explosive, HDR-friendly brightness. It's worth reflecting at this point, too, that while the 65XE9005 might not be the brightest HDR TV around, it's actually decently bright by the standards of similarly priced rivals. However, with OLED panels offering deeper blacks, individual pixel brightness and reasonable brightness, LG's competitor - while more expensive - might be an option to consider. The XE90 also benefits from the lovely combination of ultra-subtle toning and startling vibrancy delivered by Sony's Triluminos colour technology. There isn't as much luminous intensity and volume to the 65XE9005's colour tones as you get with the brighter XE9305, but you'll struggle to find a 65-inch TV that uses colour as deftly and effectively as the 65XE9005 for anything close to its £2,500 price. The extended range of colour tones made available by Sony's Triluminos processing also means there's no sense of any texture being lost by any lack of colour precision. This helps the 65XE9005 deliver emphatically on the sharpness and detail potential of its native 4K resolution. Nor is there any sign of the striping/banding problems pretty much all non-Sony TVs occasionally exhibit in large areas of subtle HDR colour variation, such as skies and clouds. The 65XE9005 may not have quite such powerful processing as the XE9305 range, but it still shows off Sony's unique capabilities when it comes to handling motion. The True Cinema setting of the Motionflow motion processing engine is particularly excellent for movie viewing, gently attending to judder and blur without going so far that the picture becomes unnaturally fluid or suffers with distracting processing side effects. Even if you opt to leave the MotionFlow system turned off the 65XE9005 still dodges the LCD judder and blur bullets better than most. Aside from its reduced brightness and colour intensity, the one other picture performance area where the 65XE9005 falls noticeably short of the XE9305 series is with its upscaling of HD sources. The dual database upscaling engine delivered by the X1 Extreme chipset inside the step-up models does a noticeably better job of adding more detail to and removing more noise from HD sources while translating them into 4K signals. So there's a slightly more defined gap on the 65XE9005 between the look of native 4K and HD sources. It's important to stress here, though, that while the 65XE9005 might not measure up in HD upscaling terms to the XE9305, its upscaled images still out-detail those of many similarly priced other-brand rivals. There's also one more area where the 65XE9005 slightly outguns its step up XE9305 siblings: input lag. It takes just 31ms on average to render images versus 38ms on the 55XE9305 - and it delivers this figure more consistently than the step-up model, which sometimes strays beyond 50ms. Our 65XE9005 review sample did suffer with a couple of other issues, though - one expected, one not. The predictable one was that the 65XE9005's pictures start to break down quite sharply once your viewing angle shifts beyond around 25 degrees. In particular, the halos of light around peak bright HDR picture objects become far more noticeable and distracting. So much so that this has to be a serious consideration for any household with a room layout that will routinely find one or more people watching the TV from down its sides. The unexpected issue we spotted was some pretty eye-catching glowing noise over the very brightest parts of aggressive HDR images. Fortunately, the sort of content that shows up this problem is pretty rare, and you can make the glowing disappear by switching to the 65XE9305's Custom picture preset. Weirdly, though, no other less "wholesale" picture adjustments seemed to make the glowing go away. Sony has confirmed to us that this issue is not specific to our test sample, but claims it will fix it via a firmware update. This hadn't materialised at the time of writing, though to be fair it's a flaw that does strike us as being more of a fixable bug than an insurmountable screen limitation. The 65XE9005's audio is pretty uninspiring. It sounds reasonably rich and well-rounded with typical daytime TV-type content, but put it under more pressure with an action movie and it's soon found wanting. Treble sounds become harsh, small details sound brittle and thus exaggerated in the mix, and bass rumbles and explosions sound thin and unconvincing. Might want to consider a soundbar in the mix with this set, then. The 65XE9005 isn't quite bright enough to be considered a classic HDR TV, and while its direct LED lighting is welcome overall, it's implementation is pretty basic when it comes to the amount of local light control it offers. However, put the 65XE9005 fairly into the context of its surprisingly affordable price and it becomes a really exciting option for serious movie fans unable to stretch their budget beyond £2,500. If you can live with a 10-inch smaller screen, Sony's step-up LCD range for 2017 gives you better video processing, much more HDR-friendly brightness and Dolby Vision HDR support. Though it can also suffer occasionally with slightly more backlight blooming. Samsung's flagship 65-inch TV from 2016 is still available at a discount price, and combines a direct LED lighting system with more effective local dimming than you get with the Sony and considerably more brightness. Stocks of this ‘classic' HDR TV seem to be dwindling fast, though, so if you want one you'd better get a move on.